Queues control Inbound and Transfer functionality. You can manually add queues to a User. Admins do this to make sure certain queues (like the ones that are coming from inbound numbers) are being received by certain agents. 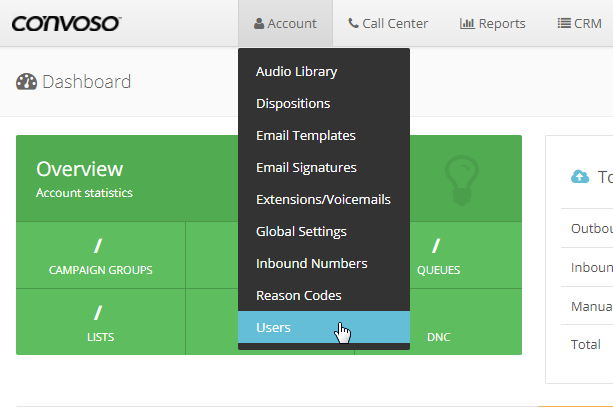 From the Dashboard, click on Account and select Users from the drop down. Under Show Users, click Action button and select Settings from the drop down. Queues will be auto assigned to this agent once he logs in unless admin decides not to. If you are an admin and Call Center Queues shows no results, you need to make sure that admin Queues are assigned the the Admin Queue Access Level.